A petite Hand Tied of everyday flowers in a selection of sweet shades of pinks and yellow. Perfectly pretty for any occassion and always sure to please. 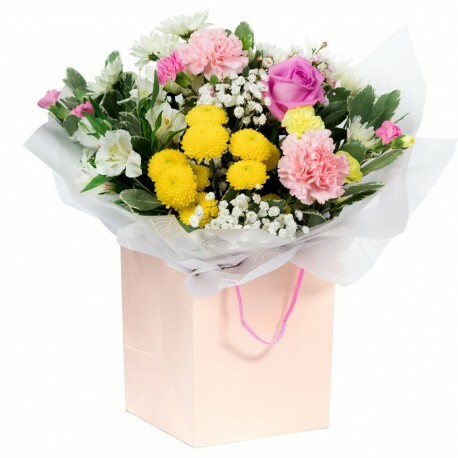 Beautifully gift wrapped and containing water and placed in a gift box or bag. Add a personal message to complete. All handmade and ready for delivery in Hereford and surounding ares by Hillmans Florist. Some flowers are delivered in bud for maximum vase life.